It's a two layer bracelet with off-white faux pearls, swarovski crystal bicones and rondelles. Made on tiger's tail and chain and ties with a cute lil toggle clasp. 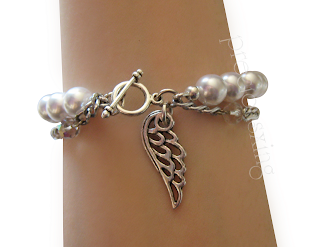 The wing is one of the (many) main new things I bought, I just thought it worked perfectly on this bracelet! I realised I have only called my jewellery pieces by pretty much their literal description so I decided to name this one the Angelique Bracelet ~ cliched much? XP I like this bracelet and I'd even be tempted to create it or a similar design for a giveaway at some point if ye like it. Just a lil pick of what it looks like on. I don't really model my pieces, I know some people can do a really good job of it but I'm the behind-the-camera kinda person =P I was kinda inspired to do this piece by my Vday present (as you may know my bf and I agreed on no pressies) but he surprised me with a beautiful white rose anyway! <3 It's just a lil piece of casual elegance. so kawaii! can't wait to see more of your creations. where do you order your beads? OMG GOOOOORGEEOOOUS bracelet! So pretty and angelic!!! Love it!!! Hi Rachel - hehe I don't know why you're complimenting my jewelry - you make gorgeous jewelry yourself! I love that bracelet! Love that angel wing, really pretty! @xbbkay Aw thank you! <3 ha ha I think I might have to too!! You did find some very pretty ones =) Thank you for following me! Wow, incredible!! 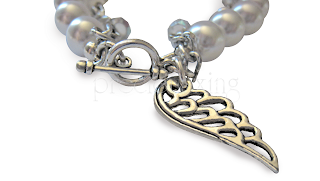 !the pearls are really match with the angel's wing!! @ciawei Thank you =) I'm so happy you like it! @Jaimee Aw thank you so much! =) That's so great to hear!